During the 1940's, women's fashion sought practicality and simplicity, as more women worked and wore utility clothing during wartime rationing. 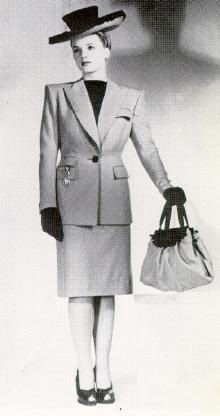 In the beginning of the decade, woman carried on the style of squared shoulders, from the 1930's. Skirts and dresses that ended just below the knee were very fashionable. Woman sought a small waist, which was often formed by corsets and belted waists. The hour glass figure with broad shoulders, tiny waists and full hips, was the ideal style for women. Although some people did not have the shape, the clothes of the time were designed to look like you did have the figure. A major change for women came in the 1940s, as pants were becoming more popular. This was in part because women were then working in factories and needed clothing that was safe and would not tear or snag in machinery. 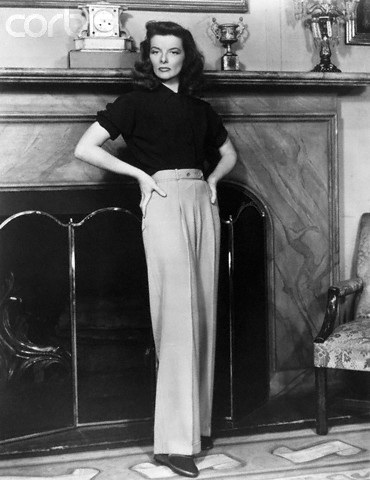 The popular style of pants were high waisted with full legs and wide cuffs at the bottom. Tailored suits were also popularized and became the dominant form of utility fashion. Skirts were often paired with blouses and shoulder pads. 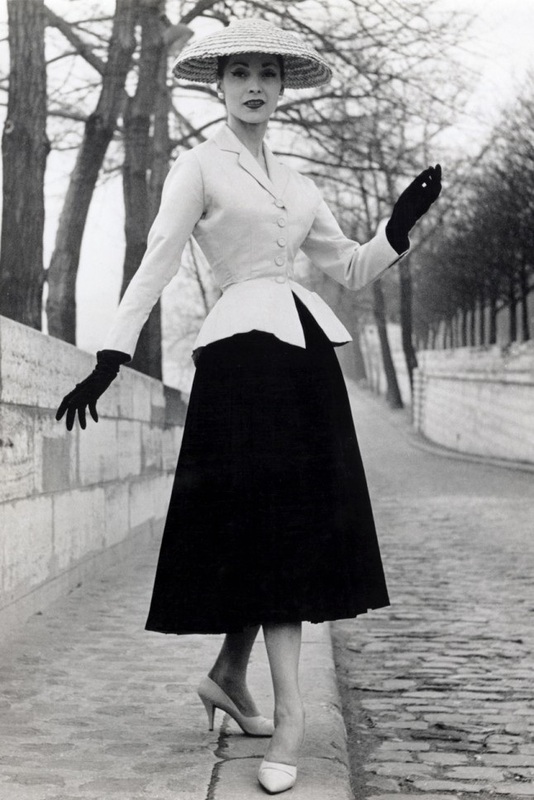 The short, peplum style of jackets and shirts helped women narrow the look of their hips and show off their slim waist. As the decade went on, teenage girls started to wear sweaters and knee-length skirts, typically pared with bobby socks. By 1947, the “New Look” transitioned the change of the utility style created by the war. The New Look strengthened femininity by changing the squared shoulders to rounded shoulders, introducing “shapely bust lines,” and continuing the closely-defined waistline look. Skirts hung right below the calves and became slightly padded and full. Hats, turbans, and berets became a big hit in the 1940s. Accessories and other products were often homemade and tended to conserve material from recycled fabrics, creating a nice look without expense or waste. Altogether, women did as much as they could to prevent spending on such things as their wardrobe during the war, and after the war, transitioned to a more feminine look. With the want for an "hourglass figure," women often wore belts around their waists. This slimming look was very popular in the 1940's. In the 1940's, tailored suits became very popularized. This look became dominant for the ideal "work-woman" and was a dominant form of utility fashion. In addition to the belted waists, women often wore peplum jackets. A major style for women in clothing were slacks (pants). These were needed for working in factories because clothing needed to be safe against tearing and snagging in machinery. This look contained high waists and full legs with wide cuffs at the bottom. The ideal slim waist that was craved by women came in all sorts of clothing. From evening gowns to nightgowns, women had a tight waist. This image is an example of a closely-defined waistline in a simple house dress. 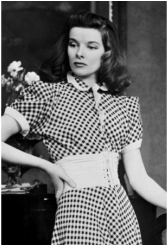 The "New Look" established in 1947 contained rounded shoulders and a tight waist. This image shows how while there are still shoulder pads, they were no longer square. With trying to obtain a slim waist, many women also wore corsets. Most corsets were worn underneath clothing to hide the fact that it was being worn, however, this image provides an example of what it looks like. 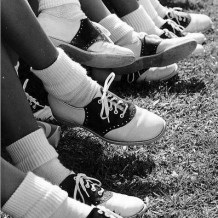 During the 1940's, teenagers mostly wore bobby socks. Theses socks were worn because along with the knee-high skirts came the showing of ankles--which led to a need for sock-style. Norman Norell was an American fashion designer. He was most well-known for his "elegant suits" and his "tailored silhouettes." Norell truly became famous during the 1940's, when he partnered with Anthony Traina in Traina-Norell. In 1943, Norell won a Coty Fashion Award and became a critic at the Pratt Institute fashion department (where he was previously a student). In 1944, Norell launched chemise dresses, evening dresses, fur coats, sequined evening sheaths, fur slacks and empire-line dresses, which quickly gained popularity.